Like a previous MIBM's Lace Earrings, here comes another project that is a great way to use an old lace table cloth or curtain. 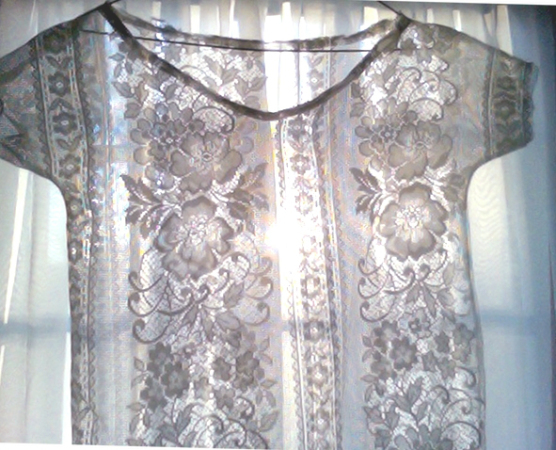 I made this lace shirt following Yellow Suitcase Studio's Lace Top Tutorial. It was so easy to follow (especially for someone like me who has very little sewing experience) and I finished it in one night. She does a great job using photos and written instructions to help you out! This is the first tshirt I've ever sewn myself so I'm very happy with the result. I didn't finish the sleeves partly because I like the unfinished look and partly because I was done trying to fiddle around with my very, very old sewing machine. Have a great week! I'm heading back to school in two days so expect the next update soon! Great idea and beautiful end result too! I'll have to score some old lace at the thrift store, maybe tea dye it and try this one. Thanks for sharing! Thanks for commenting! I never thought of dying the lace - I bet that'll be lovely! Thanks for the link! I love the lace you used :) It's beautiful! Also, that tip above about dying the lace from @brownbirdgreenstring is great. I hadn't thought of that either. So many options for customization! It's amazing that you can make that from scraps. Have always been a fan of lace.